Bill Bellmer, village historian of Garden City, challenges you to solve this weekend's wonderful carless Mystery Foto. Courtesy of Town of Hempstead Archives. Identify the location of the Mystery Foto and the orientation of the photographer. 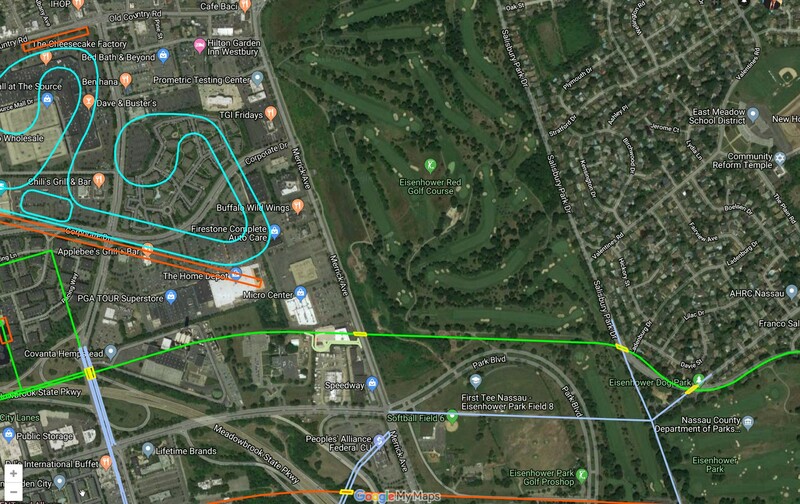 The intersection of Merrick Avenue and Stewart Aveue in Westbury and East Meadow. The photographer was looking north towards Old Country Road. 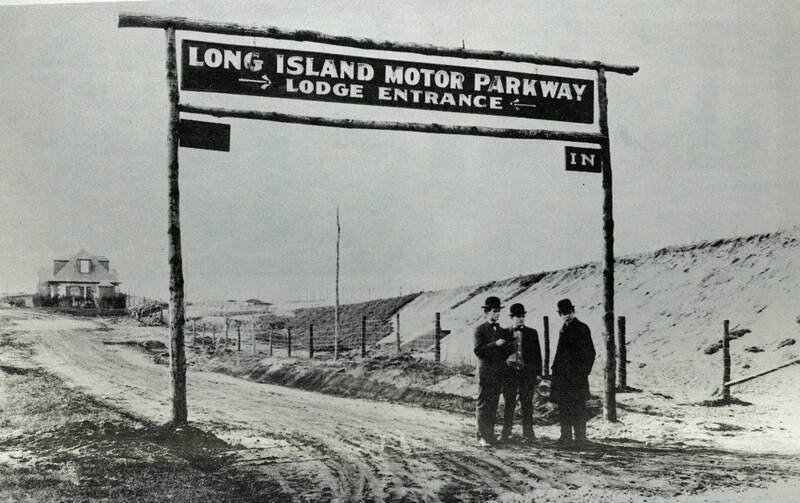 Link the Mystery Foto to the Long Island Motor Parkway and the Vanderbilt Cup Races. The Meadow Brook Lodge can be seen on the left with the remains of the Merrick Avenue Motor Parkway Bridge. 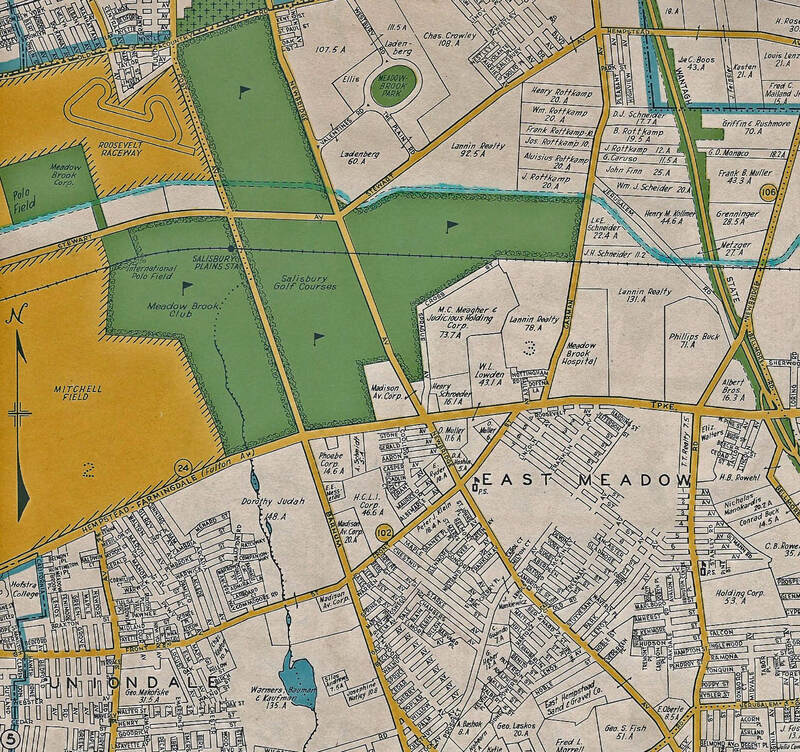 The Vanderbilt Cup Races of 1908 to 1910 were run in this section of the Motor Parkway. What was the likely purpose for the structure on the right? What is on this location today? According to my favorite co-author Al Velocci, the building is the starter shack for the Salisbury Country Club course now the Eisenhower Park Golf Course. 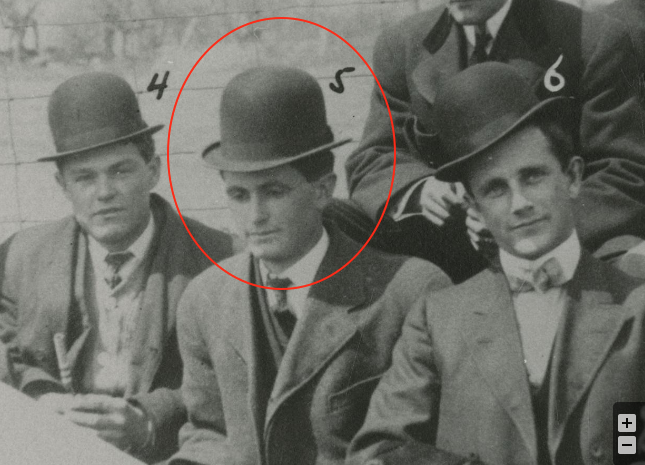 What was the approximate date of the Foto? Provide a rationale. The photo from the Town of Hempstead Archives is dated March 25, 1944. Rationale: The Merrick Avenue Motor Parkway Bridge had been demolished. The Meadow Brook Lodge was still standing, it was demolished in 1954. The absence of automobiles on the road during World War II. The Stewart Avenue sign post. 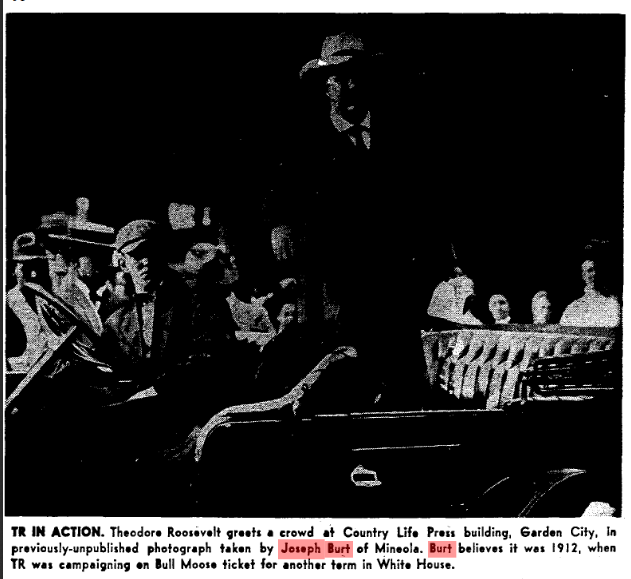 Joseph Burt (1886-1971), a commercial photgrher from Mineola- his mark is in the lower right corner. Kudos question: Can you find the airplane in the photo? Greg O. first spotted the airplane above the Meadow Brook Lodge. Kudos for finding the airplane above the Meadow Brook Lodge to Greg O., Art Kleiner, Tim Ivers, Frank Femenias, John Cunningham and Scott Eckers. The Meadow Brook Lodge seen six years after the Motor Parkway closed. An airplane heading to Roosevelt Field can be seen above the building. Note: The concrete post surrounding the Lodge. Remnants of the west embankmant of Merrick Avenue Motor Parkway Bridge. The pole reads "STEWART AVE." The tower of St. Brigid's Catholic Church can be seen to the right of the post. The building on the right is the starting shack for the Salisbury Links golf course. 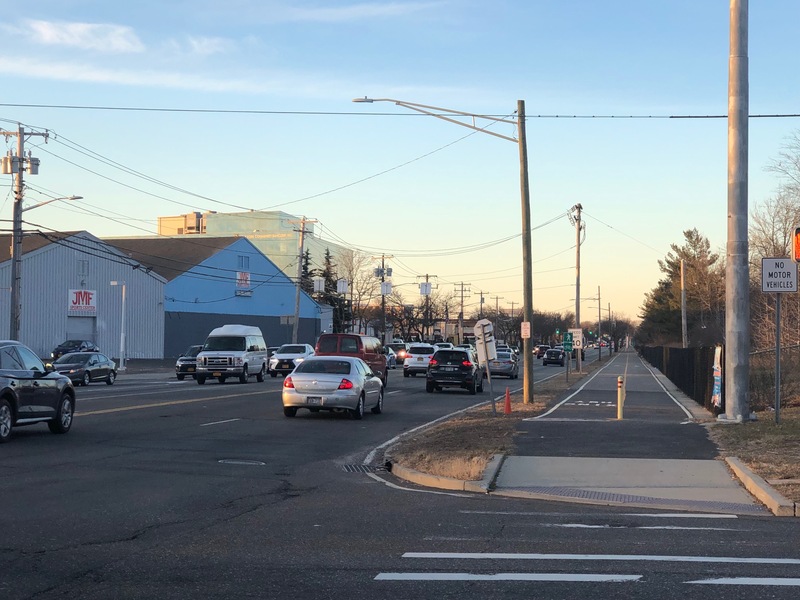 Check out my favorite co-author Al Velocci's comment concerning another link to the Long Island Motor Parkway in this close-up. A flood culvert can be seen on the remains of the west embankment. 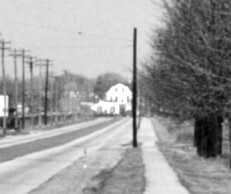 The white building was Felice's Restaurant located at the intersection of Old Country Road and Merrick Avenue. The location is now Baci's restaurant. 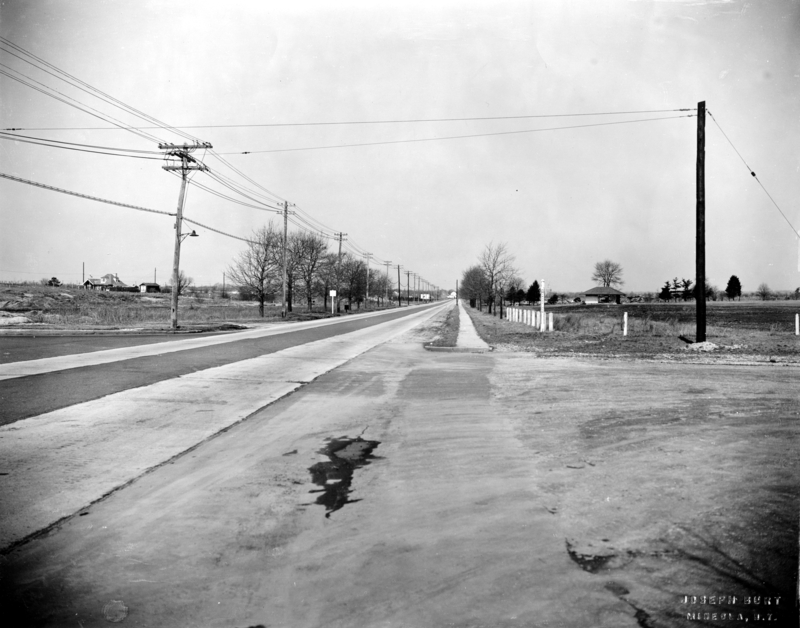 Compare the number of automobile on Merrick Avenue today as compared to 1944 during World War II. The distinctive tower can be seen to the right of the Stewart Aveune sign post. Check out the culvert that is also seen in the Mystery Foto! The Meadow Brook Lodge can be seen on the left. 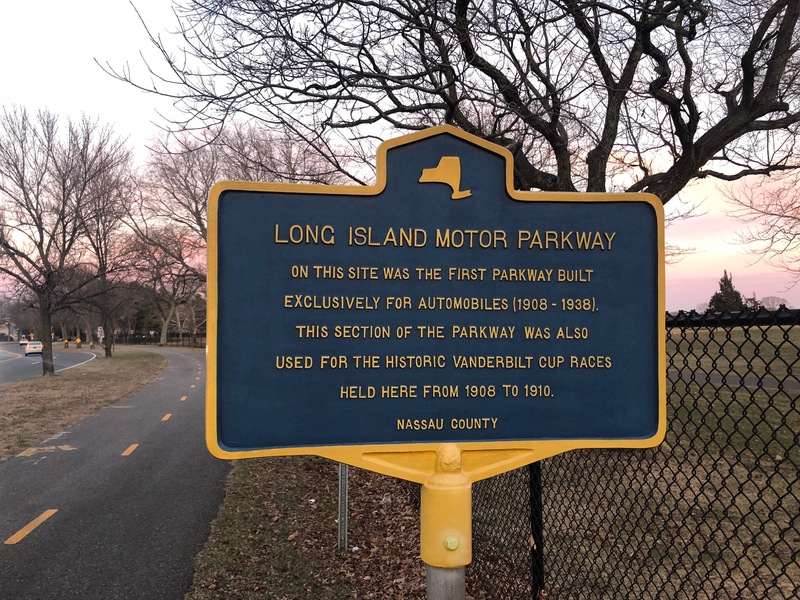 The nearby Long Island Motor Parkway historical marker. Village Historian of Garden City? Almost had me thinking I was seeing Clinton Rd. But this is clearly Merrick Ave looking north at Stewart Ave. Today, this is the entrance to Eisenhower Park. The Meadowbrook Lodge, in all it’s glory, stands to the NW of his intersection. (By the way, the street sign says Stewart Ave.) The photographer’s name is on the picture. I have seen this gentleman’s name on others. I do not know what the structure on the right is. Perhaps it had something do to with the golf links. The picture is after the LIMP closed, and obviously after the bridge over Merrick Ave was destroyed. Wow. It’s like jumping in a time machine. I sincerely thank everyone who brings us these photos. When I look closer to the right, it appears that there are piles of broken concrete just about where the motor parkway should be. We are looking north on Merrick Avenue from the intersection with Stewart Avenue. The LIMP Meadowbrook Lodge is near the left side of the photo. 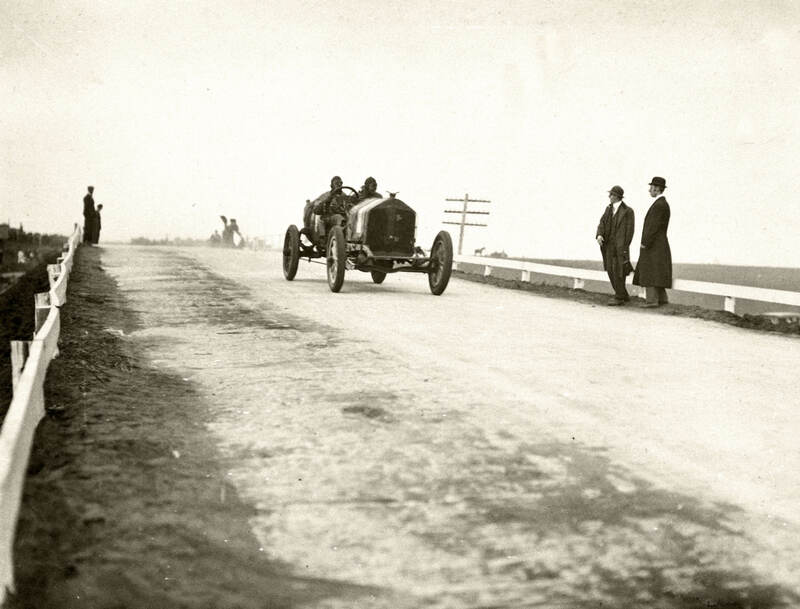 The Merrick Avenue LIMP bridge had been torn down when this photo was taken but had been part of the course for the 1908, 1909, and 1910 Vanderbilt Cup Races. The building on the right appears to be some form of restroom / caddy shack for golfers on the Salisbury Links / Salisbury Country Club. Today that property is part of Eisenhower Park. Since the bridge has been torn down and Stewart Avenue west of Merrick Ave. is in good shape (maybe even freshly paved) yet the sign post on the northeast corner still indicates Stewart Ave. and the road on the east side of Merrick Ave. appears to be unpaved (under construction?) as part of the park loop, I’m guessing the date around 1941-1942. I think the photographer could be a Joseph Hunt of Mineola. Avenue on the right leading into today’s Eisenhower Park. 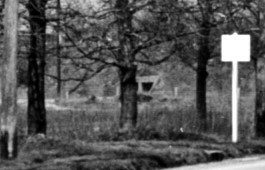 On the left it looks like the Meadowbrook Lodge and the former Merrick Road bridge is gone (1940). 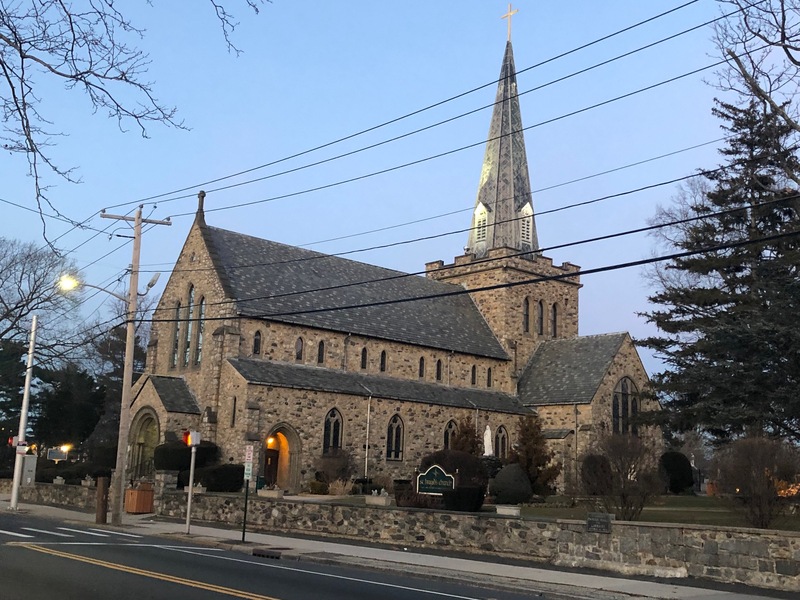 It looks like Felice’s Restaurant, Westbury, at the far end of Merrick Avenue and in the distant right center it looks like the steeple of St. Bridget’s church on Post Avenue. The building on the right may have been part of the old Salisbury Links Golf Club, maybe the caddy house. That area today is the golf course. -Identify the location of the Mystery Foto and the orientation of the photographer. Looking North from the intersection of Stewart Ave and Merrick Ave. I can just about make out ‘STEWART AVE’ vertically on the street post on the right. 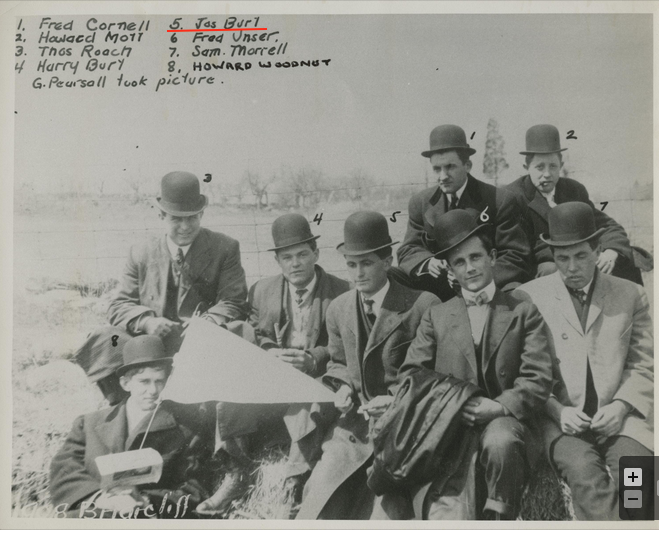 -Link the Mystery Foto to the Long Island Motor Parkway and the Vanderbilt Cup Races . -What was the likely purpose for the structure on the right? What is on this location today? Unsure, looks like it could have been a restroom! Nothing there now except for the bottom edge of the Eisenhower Red golf course. -What was the approximate date of the Foto? Provide a rationale. Guessing, but I’d say sometime around 1950. Lodge was gone by 1955, LIMP bridge gone by 1940. 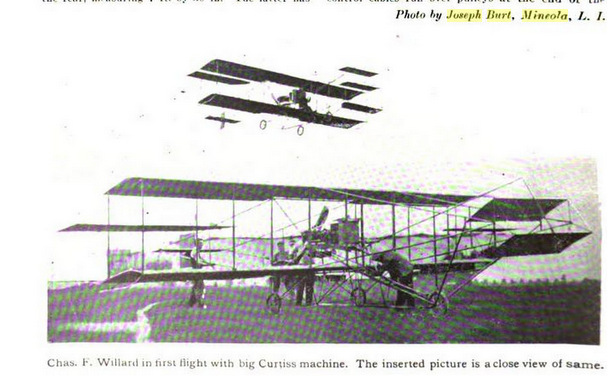 Two interesting observations in the photo; first is a plane captured flying just above the lodge. And second, Maybe I’m seeing things, but is a house being transported down Merrick Ave far off in the distance? Update: A Kudos question has been added. Identify the location of the Mystery Foto and the orientation of the photographer. intersection of Merrick Avenue and Stewart Avenue, looking north up Merrick Avenue towards Westbury. Link the Mystery Foto to the Long Island Motor Parkway and the Vanderbilt Cup Races . Meadowbrook Lodge upper left part of the photo; ran through Salisbury Links to the right. 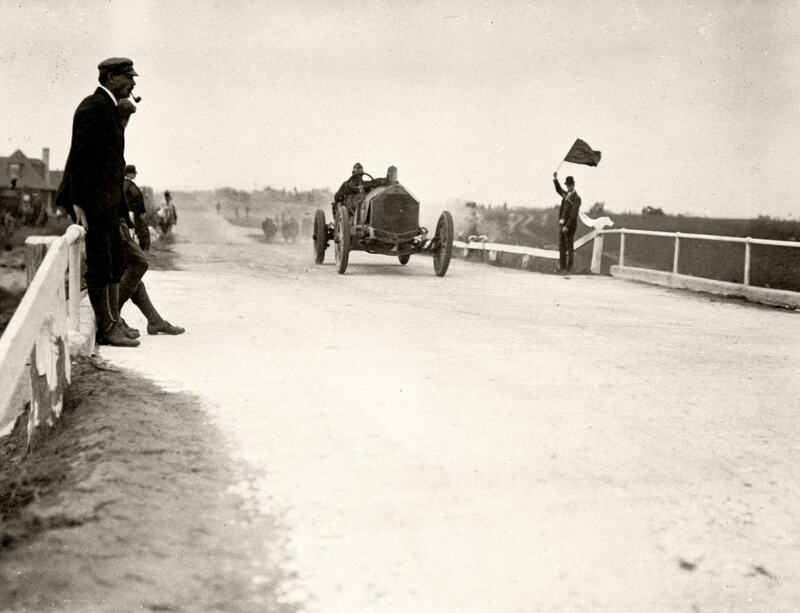 Part of the 1908, 1909, 1910 races. What was the likely purpose for the structure on the right? What is on this location today? Possible answers - golf shack, train stop - Eisenhower Park. Who was the photographer? Local LI photographer, Joseph Burt. Kudos question: Can you find the airplane in the photo? Located above what I believe to be the Meadowbrook Lodge (third photo). My own Kudos question: Identify the structure which can be seen in the close up photo of the Stewart Ave. marker. Above the marker. My answer: St. Brigid Catholic Church in Westbury. Update: Additional close-ups have been posted. Great photo Howard, it was taken from the middle of today’s Merrick Ave., looking north at Stewart Ave., at the entrance to Eisenhower Park. On the left center is the Meadowbrook Lodge. 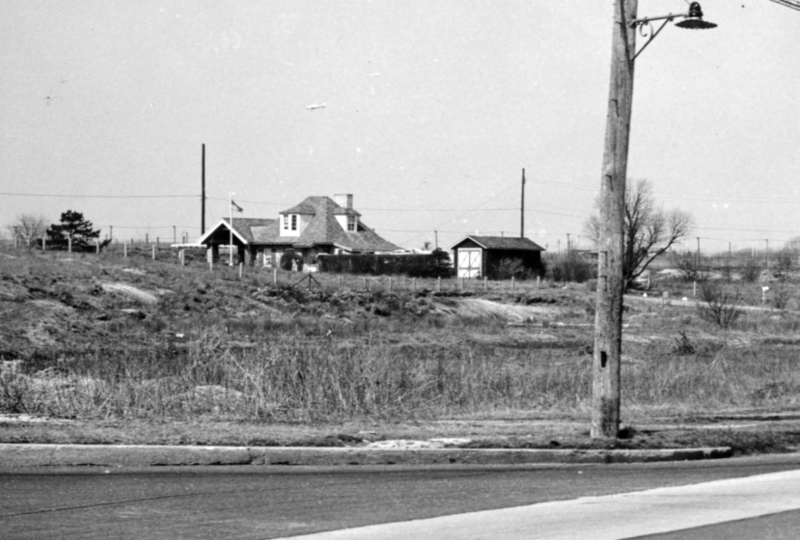 The building on the right is the golf courses starter shack/clubhouse when the park was known as Nassau County Park. 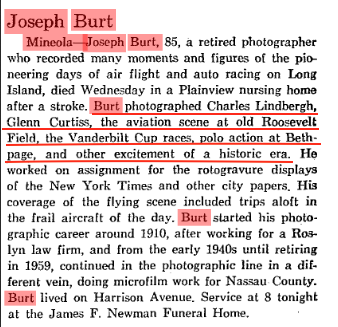 The photographer was Joseph Burt. Interestingly he was hired by the Parkway in the opening days to shoot photos for promotional purposes. 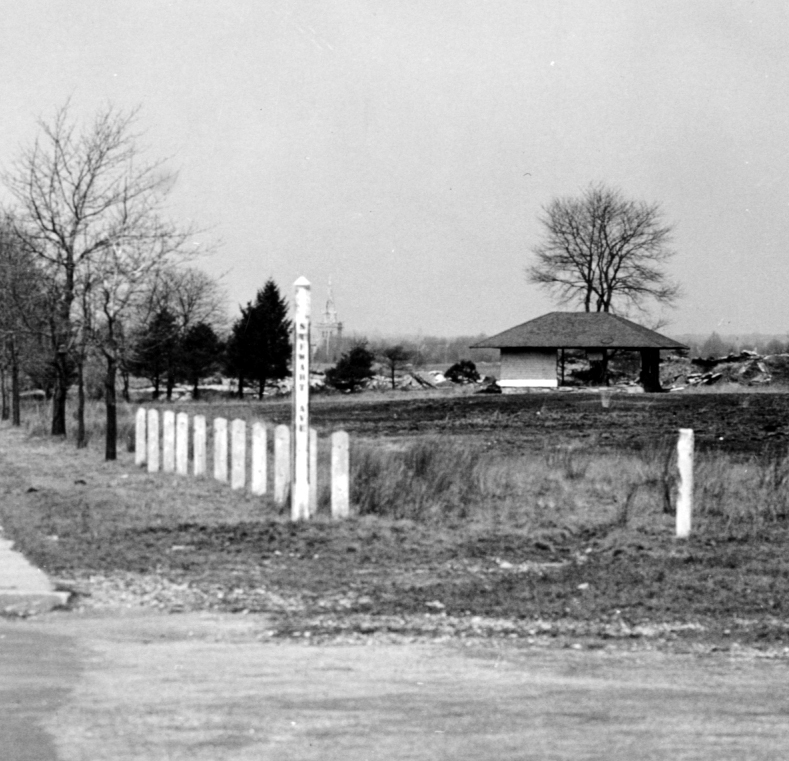 In the photo featuring the Stewart Ave. signpost are a number of white painted posts. These are from that section of the Parkway r.o.w. that one time ran thru the Park. The County salvaged literally hundreds of the posts when the Park was being developed. Another building I recognized is the one at the very north end of Merrick Rd., It appears at a white blob in the center of the road but the roof configuration gives it away as Felice’s restaurant which was located at the southwest corner of Old Country Rd. and Merrick Ave. until the 1960’s. It was replaced by a gas station which was later demolished and replaced by Baci’s, the present occupant. 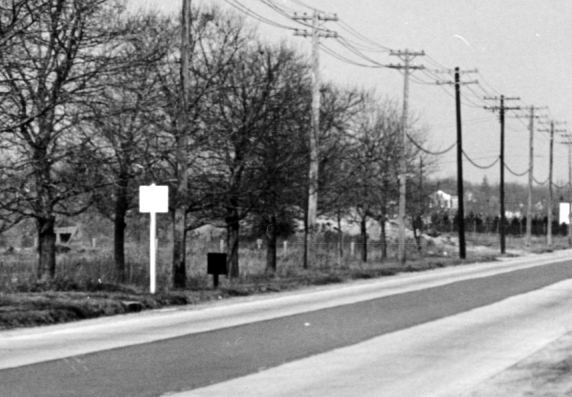 The Parkway bridge over Merrick Avenue is gone so we know the photo was taken after the Parkway closed in 1938. My guess is the late 1940’s when the Park was dedicated. Another item I noticed is in the blow up photo of featuring the back of the white signpost. Look to the left and you will see the viaduct that was built for drainage purposes. Question Howard, how was Burt able to shoot this photo without any vehicles in the picture? The airplane is on the left in the air over the Meadowbrook Lodge. Love these older images, thanks Bill! 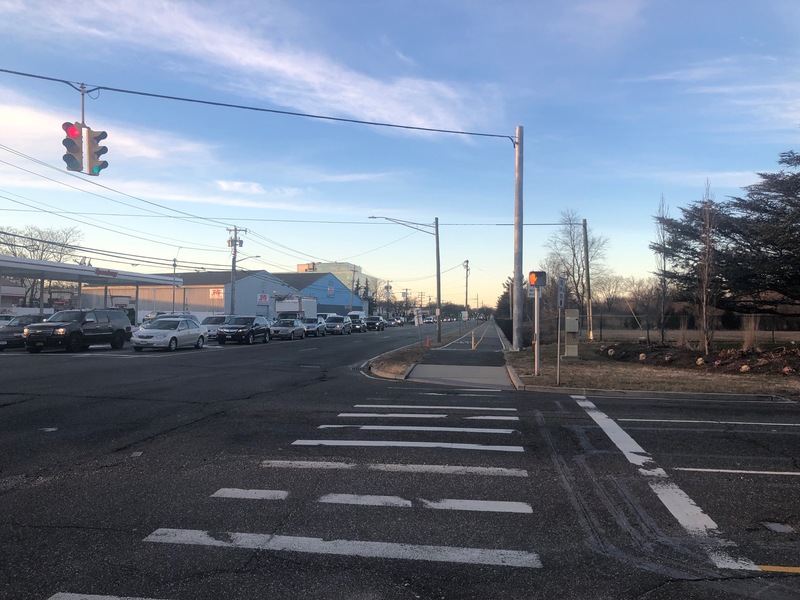 *Location & Orientation: Southeast corner of Merrick Ave & Stewart Ave ( I can just make out Stewart Ave inscribed on the post at the northeast corner ), Westbury NY. View is north. *Structure on the right & present day: A caddy shed/shack for the golf course. There’s not any building there now. A much wider Park Blvd was carved out just north of this east side of Stewart Ave. The blvd does the loop curve to the north before heading south. Maybe the shack was in the way. Then there’s a refuse area north of the blvd. *Image date & reasoning: There’s no evidence of Park Blvd, yet ( carved out after 1950 ). LIMP bridge is no more, toll lodge lived until 1954. I’ll say 1945. *Photographer: Joseph Burt, 1886 - 1971. Mineola resident who practiced photography as a hobby. And I bet he established a photo collection, thanks Joe! 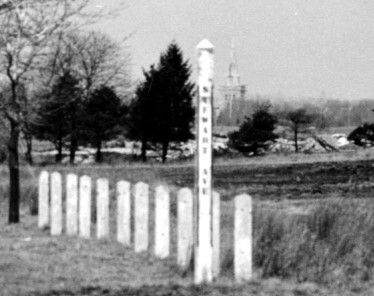 *Aircraft in photo: Likely the dark shape seen in the 5th closeup, above and to the left of ‘Ottavino Memorials’, west side of Post Ave.
*Foto link to the LIMP & VCR: The Meadowbrook Toll Lodge is clearly seen to the northwest. Pretty sure the remains of the west abutment is there thru the row of trees, and fairly sure I see a culvert at the embankment. The 1908, 09 &10; races were here, too. Thanks Bill and Howard for this FABULOUS view in Salisbury. Never seen this before in my 56 years. This view is alarming and unrecognizable today. We’re at the entrance to Eisenhower Park on the right side off of Merrick Ave. There’s a red light camera here today. Photographer Joseph Burt of Mineola is standing on the sidewalk looking NNE. 1908-10 Vanderbilt Cup Races began here on top of the hill at the Meadow Brook lodge. Many concrete posts outlining the Motor Parkway property line. Structure on right is likely vending machines/restrooms to accomodate the golfers. Golf course remains here today. Date is sometime after the ‘50s when the lodge was removed. The silver bird is directly above the Meadow Brook lodge and a smaller black bird above the Stewart Ave street post. Fantastic! Forgot to mention that I had spotted that culvert in the old bridge’s West embankment as well. • Identify the location of the Mystery Foto and the orientation of the photographer. • Link the Mystery Foto to the Long Island Motor Parkway and the Vanderbilt Cup Races . The Meadowbrook Lodge is on the northwest corner. • What was the likely purpose for the structure on the right? What is on this location today? This structure was in the golf club; it is in Eisenhower Park today. • What was the approximate date of the Foto? Provide a rationale. • Who was the photographer? • Kudos question: Can you find the airplane in the photo? Thanks for a great picture this week! Update: A 2018 Google Map has been added. 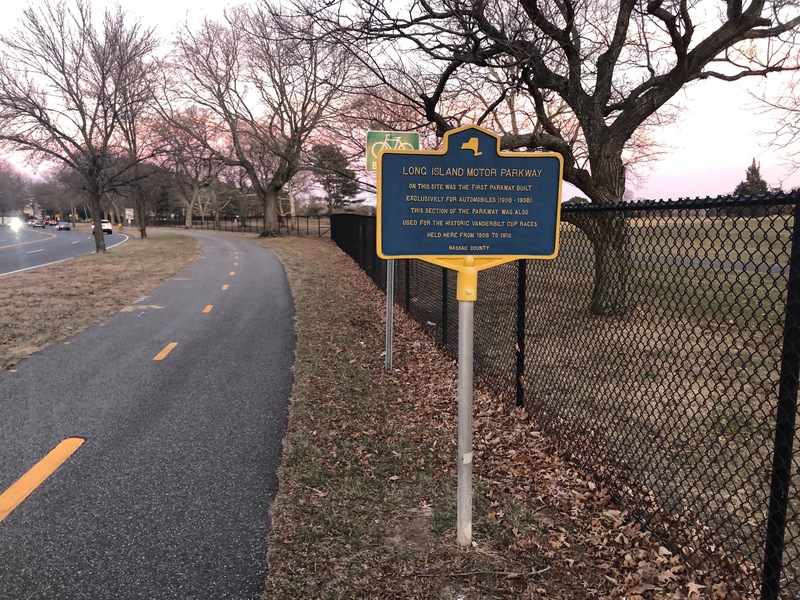 This image will be used as a guide for the planned placement of a Long Island Motor Parkway historical marker adjacent to the Merrick Avenue Bike Path. I like “Joe Burt and friends”, everyone is wearing the same hat. And nicely dressed!